What Stained Glass Projects Will You Make in 2017? Happy New Year to all! We can’t wait to share some of our finished and upcoming stained glass projects with you. What are your stained glass project plans? Panels or light catchers? Weekend project or multi-year masterpiece? Chime in to share with your fellow glass fans and fanatics. 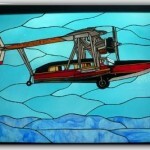 Check out this stained glass airplane panel! 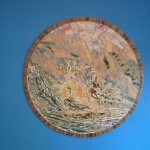 It was created by Dale Hammond from a Paned Expressions Studios custom stained glass pattern. I love the details in the wings, and the perfectly place lettering along the top and the tail. Wonderful! Great job! Thanks for sharing, Dale!